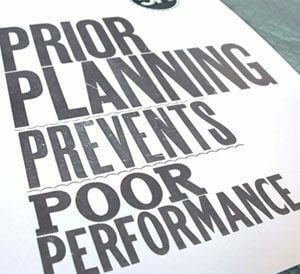 The 5P’s (that is Prior Planning Prevents Putrid Performance) is a well known adage in emergency management, project management and several other disciplines. It is also not looked upon as necessary by many many small and mid-sized businesses. Why plan? It’s such a waste of time. My answer is that without planning, how can you anticipate the expected and mitigate the unexpected? Case in point: I belong to the Nassau County, NY Medical Reserve Corps (MRC). The MRC is made up of medically trained individuals and others that can be called out in an emergency or in this case pre-deployed for an event. The event was the Long Island Marathon (held May 6th). It was the first such event of that magnitude the organization had tackled. Eight thousand runners passed 11 medical stations staffed with teams ranging from two or three Emergency Medical Technicians and/or Nurses to Doctors, Nurses, Paramedics and EMTs, Physical Therapists and list of medically trained people can go on. The Nassau County Department of Health, which runs the MRC did the planning. Kudos where kudos are due and they did an outstanding job. Sure there were some bumps and learning curves, but that’s what a plan is all about; a starting point to base performance upon, and then a “hot wash” or review to see what worked, what didn’t, why it didn’t and how it can be improved. Nassau County DOH did its 5P’s; and the results and their performance was superb! So how does your business plan stack up against your plan? Can you say that you followed your plan and that you succeeded? Then again you need a plan, a written plan, not just a vague idea in order to compare. Think about it and if you don’t have a business plan — start planning! By the way, a business plan can be as short as 2-3 pages plus a 12-18 month rolling budget. Many people use 6P’s, which has more colorful language but means the same as the 5P’s. Why VC/PE market space is suffering; the answer is not rocket science!